G.L. Huyett, an ISO certified manufacturer and master distributor of non-threaded fasteners, is excited to announce their acquisition of the HANDI-CHEK packaged goods business of ITW Shakeproof Industrial Products, along with the HANDI-CHEK brand. G.L. Huyett - Manufacturer and Master Distributor - has acquired HANDI-CHEK packaged fastener assortments, replacement parts, and specialty components from ITW Shakeproof Industrial Products. G. L. Huyett is pleased to announce that it has purchased the HANDI-CHEK packaged goods business of ITW Shakeproof Industrial Products. The acquisition includes equipment, inventory, assets, and intellectual property - including the "HANDI-CHEK" brand name. 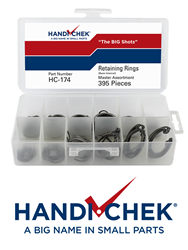 "HANDI-CHEK is one of the original packaged fastener brands and we are excited at the opportunity to further strengthen the brand equity and franchise with our promotional efforts," noted Greg Tabor, Vice President of Marketing and Procurement. Tabor stated that G.L. Huyett plans to convert its existing packaged goods lines over to the HANDI-CHEK brand. HANDI-CHEK was founded in the 1970s and catered to farm and ranch stores in the upper Midwest. The brand was purchased by Rein Leitzke, which was later acquired by Bee Industries and folded into the ITW Shakeproof Industrial Products family. Along the way, HANDI-CHEK was promoted to the industrial supply channel and HANDI-CHEK kits are now advertised and sold by many of the industry's leading catalog distributors. "The purchase of HANDI-CHEK is another step in our current growth-oriented business strategy," said Timothy O'Keeffe, G.L. Huyett CEO. This is the third acquisition G.L. Huyett has completed in the past two years. "As with all of our portfolio, we intend to intensely invest in this business and drive value that benefits our distributor customers. This deal provides us greater scale so that we can lower our costs of assembling and kitting on our current packaged business," noted O'Keeffe. "We continue to look for strategic fits to our product and service offering," said O'Keeffe, "We have distinct management support systems to ensure that the employees and customers of retiring entrepreneurs or divesting shareholders are well taken care of and embraced into our Culture of Excellence." ITW Shakeproof Industrial Products is a division of Illinois Tools Works Inc., specializing in the manufacture of specialty cold-headed products; wire forms including cotter pins; and helical split lock washers. Visit Huyett.com today to see G.L. Huyett's complete line of Assortments and Kits, or give their friendly Sales Team a call today at 785-392-1020. Established in 1906 by Guy Huyett in the "other Minneapolis," the company is one of the oldest continuously operating businesses in Kansas. The firm is a leading innovator of products and services geared to support industrial distributors in the non-threaded fastener and power transmission sectors, delivered by competent customer-centric people operating in a Culture of Excellence.